In the midst of my kitchen organizing chaos, desperate to make the insides of my cabinets beautiful and functional, I finally unpacked some books from the basement, finding- among other things- several cookbooks I’d forgotten I had. I remember being introduced to Lucinda Scala Quinn’s cookbook, “Mad Hungry: Feeding Men and Boys.” Having just opened the boyfriend’s gym, and constantly being surrounded by hungry college-age football players, I found myself needing to make hearty foods that were still lean, still chock full of protein, and still really tasty. The recipes within began being used in heavy rotation- pork chops with apples and onions, spicy sweet potato wedges- but it’s been so long since I’d made any of them, I couldn’t remember how much I loved the recipes within. How much can we forget in four years? The sizzle of a piece of chicken when it hits a hot pan, the smell of red wine vinegar as it mingles with rosemary and garlic… I’d forgotten how much chicken broth can cook down and thicken, how a tangy sauce can be a perfect coating for green beans eaten with one’s fingers. The first recipe that caught my eye so many years ago was that of the Vinegar-Glossed Chicken. Admittedly, I’m a sucker for any use of rosemary or garlic, so I know I was drawn to this particular dish for a reason. The first time I made it, freezing, in the kitchen of our Old Louisville home, I followed the recipe notes and served on top of a few slices of pan-fried polenta. While my dad was appreciative, and seemed to like it, I remember he wondered aloud- eyeing the rosemary- why there were Christmas trees on his food… He was not used to using fresh herbs of any kind. Over the years, I Southern-ed the dish a bit, subbing Weisenberger’s cheese grits for polenta, a pot of blanched green beans alongside. 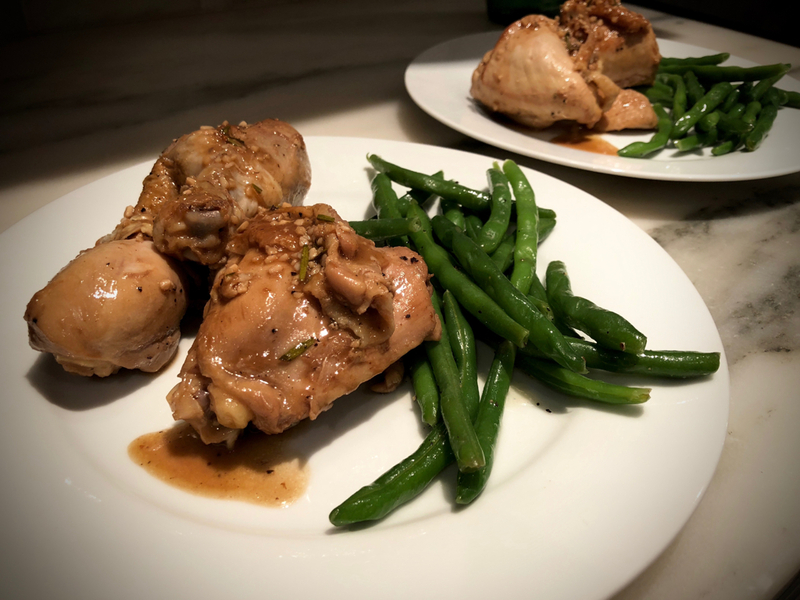 Now, though, the grits are missing altogether, and the green beans, along with this relatively light poultry dish make for a very healthy- and very tasty- meal, perfect for a Sunday night at home.